So how has the public’s perspective on the #MeToo movement changed? According to a May 2018 poll by Morning Consult, there was a wide partisan gap in support for the movement — 81 percent of Democrats said they backed the movement, compared with 54 percent of Republicans. And in October 2018, Morning Consult found that the gap between the parties had grown — support for the movement had increased by 2 points among Democrats since May and decreased by 7 points among Republicans. Some of what drove this may have been related to Kavanaugh’s confirmation hearing — prominent Republicans waged an anti-#MeToo campaign, drawing attention to the possible negative consequences of the movement for men, and public opinion on Kavanaugh’s confirmation was largely split along party lines. But we were interested in getting a broader view on how voters’ opinions on the issue of sexual harassment and the role of women in society have changed from before the #MeToo movement to now. So we looked at 2016 and 2018 data from The Democracy Fund Voter Study Group, which polls large segments of the U.S. electorate to track changes in attitudes and beliefs, including what Americans think about issues of sexual harassment and misconduct.3 And what we found is that on the whole, since 2016, Republicans have grown more skeptical of women who report harassment and the motivation behind their claims. However, members of both parties were more likely to acknowledge that sexual harassment of women in the workplace is a problem in the U.S. in 2018, compared with 2016 — so there is some evidence that more people from both parties view sexual harassment as a problem today than did before. First, let’s take a look at two questions in the survey on which Republicans and Democrats moved further apart in 2018. In 2016, 61 percent of Republicans and 18 percent of Democrats surveyed said they agreed that “when women demand equality these days, they are actually seeking special favors” — that was a whopping 43-point gap. In 2018, that gap hit 48 points, with 65 percent of Republicans agreeing with that statement, compared with 17 percent of Democrats. And on the question of whether “women who complain about harassment often cause more problems than they solve,” 54 percent of Republicans said in 2018 that they agreed with that statement, up 4 points from 2016. Among Democrats, the change was again in the opposite direction, down to 17 percent in 2018 from 19 percent in 2016. One explanation for the widening partisan gap could be that attitudes about gender equality are increasingly correlated with partisan identity. Indeed, several studies have found that hostile attitudes toward women predicted support for Donald Trump in the 2016 presidential election, along with views on racial discrimination, as some conservatives backed Trump because they feared losing their status in society. The underlying idea is that Trump’s candidacy “primed sexist attitudes, which might have otherwise lain dormant,” and, therefore, these attitudes were more salient when voters cast their ballot in 2016. And there is reason to believe that what we saw in 2016 marked a real shift between the two parties. In elections held between 2004 and 2012, attitudes toward women did not predict support for presidential candidates. So it would make sense that the Kavanaugh hearings, which took place just before the midterm elections in 2018, continued to elevate a discussion about changing cultural norms and offered an opportunity for elite partisans, like the president, to signal how they felt about issues of sexual harassment, which, in turn, may have shaped how rank-and-file Republicans and Democrats said they viewed the issue. On two other questions, the parties also moved in opposite directions. 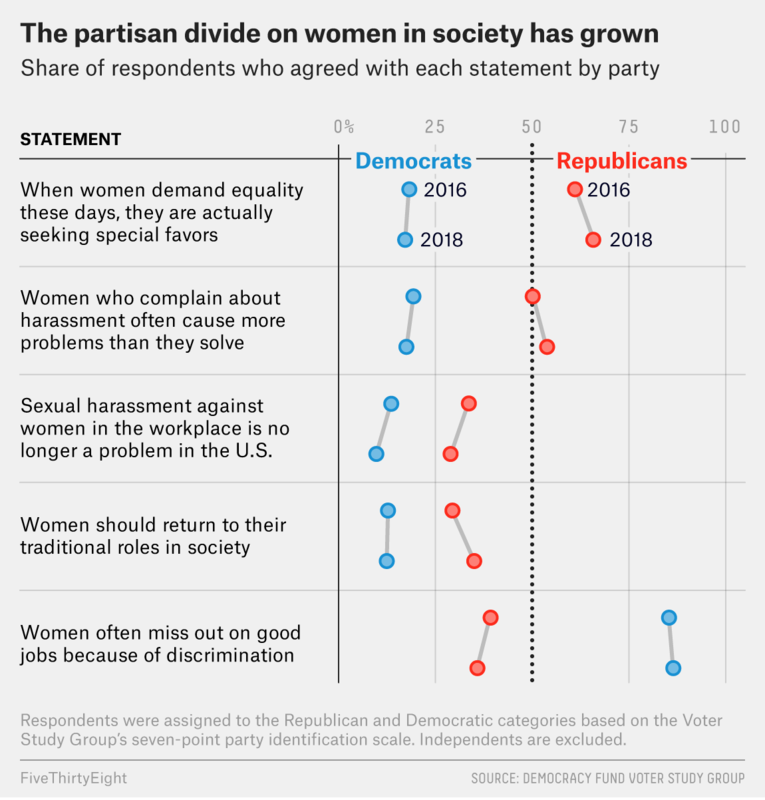 When asked whether “women should return to their traditional roles in society,” the percentage of Republicans who agreed with that statement rose by 6 points, while the percentage of Democrats who agreed declined by 1 point. But this gap may not be all that surprising. A Pew Research Center study from 2017 found that Democrats generally see changing gender roles as beneficial to society and that Republicans don’t. And when asked whether “women often miss out on good jobs because of discrimination,” the share of Republicans who agreed declined from 39 percent to 36 percent, while the agreement among Democrats increased by 1 point, from 85 percent to 86 percent. Arguably, the #MeToo movement has encouraged more women to call out inequality in the workplace, so among Democrats, this change may be more welcome than among Republicans. There was however, one question in the survey related to women in the workplace that did not reflect increased polarization. Both Democrats and Republicans in 2018 were less likely to agree with the statement that “sexual harassment against women in the workplace is no longer a problem in the United States.” Democratic agreement declined by 4 points, and Republican agreement declined by 5 points. This suggests that despite increased polarization on some issues of sexual harassment, the #MeToo movement may have made Democrats and Republicans more aware of the prevalence of sexual harassment at work. Overall, the data shows that Republicans and Democrats haven’t changed their minds all that much on questions about sexual harassment. However, the change we did find reflects a growing partisan divide, which is consistent across other issues like race, religion and immigration. And this partisan divide will probably continue to widen as we head into the 2020 presidential election. Trump’s re-election campaign will likely continue to elevate cultural and social issues that tap into divisive beliefs about gender and race in an attempt to maintain the coalition of voters who turned out for him in 2016. Weinstein is facing criminal charges in New York; he has denied all wrongdoing. Kavanaugh has denied the allegations; Biden has since said that he would be more mindful of people’s personal space. The 2016 Voter Study Group survey was administered online to 8,000 adults (ages 18 and over) between Nov. 29 and Dec. 29, 2016. And the 2018 Voter Study Group survey was administered online to 6,005 adults (ages 18 and over) between April 5 and May 14, 2018.